Kiyomi Lim's Site. : Dolly Wink 06 Make-up Video. Dolly Wink 06 Make-up Video. lets decide if it is worth your time! Many many people don't really like Dolly Wink 06 because it is quite troublesome to put it on. You have to stick it pieces by pieces. same logic as you need to spend a long time to cook in order to get the wonderful taste and looks in your meal, putting on Dolly Wink 06 is really worth the time ! When you put on Dolly Wink 06, it makes your eyes look really sweet and cute. *No wonder it's called baby cute. this one enlarges your eyes more. Dolly Wink 05 have the more natural look that the 06 which has a more cutish and gyaru look. 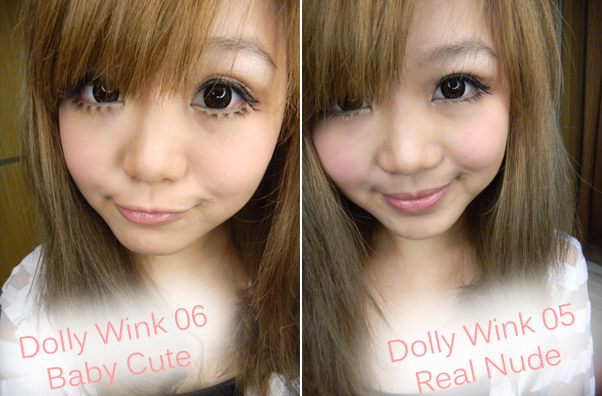 Dolly Wink 06 is also not restricted to the number of looks you can create with it. by putting Eyeliner on the Eyelash's Bone itself. So will you all try out Dolly Wink 06 ? That's all for today ! Byebye !